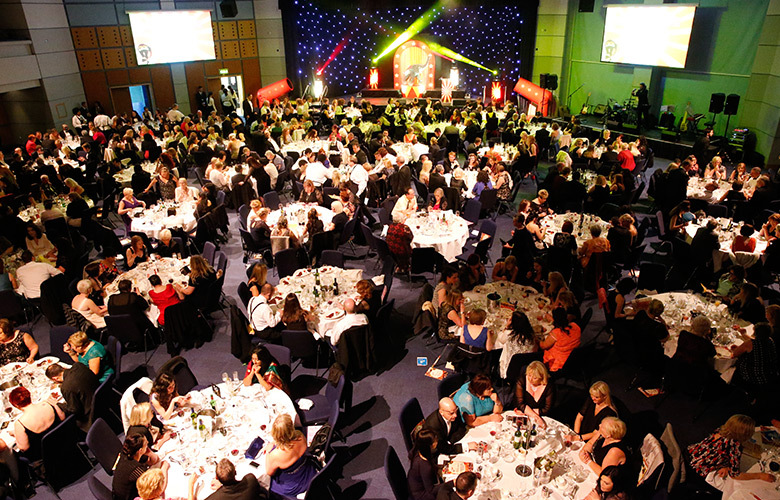 On Saturday 27th June over 500 of the very best in social care attended a glittering awards ceremony at Birmingham’s ICC, for the national finals of the Great British Home Care Awards, where the national category winners were announced. The Great British Home care Awards, hosted by The United Kingdom Home Care Association (UKHCA) and sponsored by Specsavers, brought together the winners from the nine regional Great British Care Awards held in Autumn 2014. Winners from each region were invited to compete once again to become the national champions. Sector support includes the Department of Health, the Association of Directors of Adult Social Services (ADASS), Alzheimer’s Society, National Skills Academy for Social Care and the Social Care Institute for Excellence (SCIE) as well as local authorities and commercial organisations. There were a total of sixteen award categories available for nomination, which represent all areas of the care sector,whether it be older people or specialist services and from frontline staff such as care workers and care managers to people who have made an impact in other ways such as training, and specialist care in areas such as dementia and innovation. Bridget Warr, chief executive of UKCHA said, “Being part of the judging panel for the Great British Care Awards is one of the highlights of my year. It’s a real privilege to meet all of the nominees whose skill, passion and commitment to the people they support, and their work shines through. Too often the individuals providing the care and support that enables people to continue living independently in their own homes get overlooked. The Great British Care Awards is a great opportunity to recognise and celebrate the contribution of truly outstanding individuals in the homecare workforce. “The Great British Care Awards are a wonderful opportunity to pay tribute to the lasting difference that frontline social care workers make to over a million lives every minute of every day, and pay tribute to the wonderful contribution of these frontline care workers make. “I believe together commissioners and providers need to champion the very best in social care and to do all we can to make sure that people who work in social care get the recognition they deserve. Impressed with the way that they delivered/demonstrated that culture and values are at the heart of delivering right care every time. Good balance of meeting needs and staff investment. Huw is an impressive carer. His warmth and compassion were clear in describing the work he does. To improve the Home Care service his one magic wish would be to make all his clients better. Sarah is relentless in striving to make a difference and improve peoples’ day to day life. She is passionate and dedicated about positive changes in outstanding quality of care and cultural improvement. Lorna demonstrated a true passion for the care sector stating she ‘lives her life for care’. Lorna works tirelessly to educate and inform the community about care at home service whilst leading a skilled team of care workers. Despite being clearly nervous in the interview, Jean came across as a truly caring person with an underlying calmness. Her genuine warmth must put people at their ease and she is clearly passionate about maintaining and promoting people’s dignity. Her honesty shines through and her commitment to continuous improvement is inspiring. Helen demonstrated her passion and enthusiasm for her role. She was committed to understanding her clients and took pride in ensuring that she focused on her clients needs. Helen recognises the importance of actively engaging her clients and fits her service around them. Comprising of 7 members plus manager this team look after one individual who has very complex needs. The nature of their work necessitates the members to work very closely together. This was seen recently when the team unanimously agreed to take a cut in their hours rather that to lose two colleagues. Yvonne sums up care as a vocation, having spent 30 years with WAS. She and her team are focused on supporting their people to become what they need to be to support others. Dominique has shown real innovation through the development of ‘live in care’ for her organisation. Areas such as staff retention, and moving to a paperless environment, are companied with real quality and flexibility for those receiving care. Wendy has shown an amazing kevel of hard work and commitment to Gateshead council learning disabilities services spanning over 21 years. During this time Wendy and her passionate team had constantly innovated to improve the lives of all their service users to create a whole new community. Although it was extremely difficult for the judges to decide between such high quality candidates. Daniel’s personality and charisma shone through. His passion, not only to support the clients, but he is also focused on supporting the staff and ensuring they have a good work, life balance. An Outstanding Candidate, well worthy of the award. Her motivation stems from being a recipient of social care and that experience has shaped her views. Lisa’s belief in getting the environment for someone to live well in came through in leaps and bounds. She demonstrated excellent examples of how she ensures everyone is individually supported and has the same rights as herself and you and i. she is a credit to the sector and an excellent integrator. Lauren truly is an inspiring and committed nurse. She is a fantastic example to others in making a difference to other people’s lives.